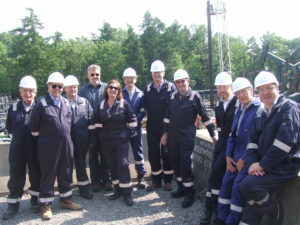 On Wednesday 23rd May, in fine weather, a party of 13 fuellers were very lucky to take part in a visit to two of IGAS’ 100 onshore oil and gas production sites in Britain, hosted by Julian Tedder, Chief Financial Officer. 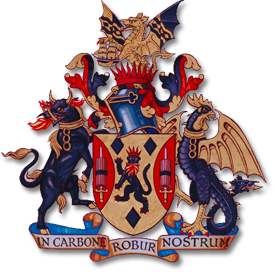 The visit was arranged by Liveryman Andrew Strawson, who, in common with the Master, has enjoyed a career was also in oil and gas. After Andrew and his wife Ingrid’s welcome breakfast of croissants, we departed by minibus to the first site, near Winchester. After a good safety induction, it was fascinating to see a “workover rig”, a small drilling rig commonly used on onshore oil and gas sites, and a beam pumps, commonly known as a nodding donkey. The advantages of the beam pumps are simplicity and energy efficiency; when well-balanced, it is possible to move the beam by hand. The beam operates a very simple cylinder pump at the bottom of the well, and is not too prone to damage if inadvertently run dry. Each beam is set up to operate across a particular range of pumping rates; changing the pump rate outside of that range entails some downtime, so IGAS is experimenting with a partner on novel alternatives to beam pumping technology (not in use at this site). IGAS Production Director, Chris Beard, explained how for higher flow rates, the current established alternatives are an electric submersible pump (ESP), which is costly at £1m per pump and may fail if run dry, or a jet pump, entailing pumping oil down the well into a small section of narrow pipe with an orifice; more oil is sucked in from the well to the orifice, so perhaps twice as much oil comes back up a second pipe, than was pumped down. The jet pump is robust against being “run dry”, so although less energy efficient, they are often used where a higher flow rate is available than could be pumped via a beam pump, with a beam pump perhaps being used later in the well’s life when it becomes less productive. IGAS generously provided each Fueller with a lunch of their choice at a lovely pub, before we moved on to the second site near Singleton, West Sussex. Here, another workover rig was in use, and it was amazing to see the speed (about 40 per hour) at which 50 foot sections of drilling rod could be attached by the small team to one another and lowered back into the hole, the workover of the well having been completed. This well-hole was bent at 90 degrees in 5 degree turns, and so led almost back to under the pub! It was curious to think that the apparently-rigid metal drill rods could cope with such a bend, and still be able to turn. 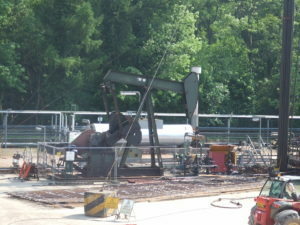 The site had more beam pumps, and a pair of small flares as there was no current use for the small amounts of associated gas (uses are being investigated, but there are commercial difficulties to overcome). As at most such sites, the oil is taken away by a small number of tankers per week, after the oil has been heated and put into separator tanks to remove the associated water, which being salty and dense, can later be pumped back down into the well. Thanking Andrew and Julian at the end of the visit, a few of us went to a local pub with Andrew.